Kate Whetten is very interested in what creates this disparity. Kate is the co-author of the book "You're The First One I've Told: The Faces of HIV in the South" (Rutgers University Press, 2013). 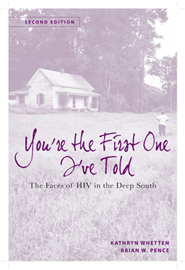 Kate Whetten joins Host Frank Stasio to talk about "You're The First One I've Told," a book that takes a deep look at 25 case studies of people who have contracted HIV in Eastern Carolina. Kate Whetten is a professor of Public Policy, and Community and Family Medicine at Duke University.